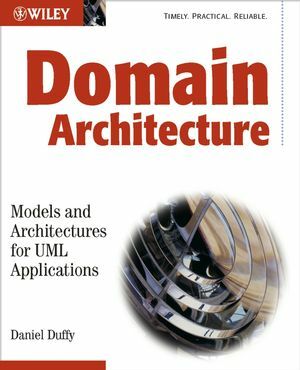 Domain Architectures is a comprehensive catalog of the domain architectures essential to software developers using object-oriented technology and UML to solve real-life problems. Providing a unique top-down view of systems, the book also provides quick access to landmarks and references to domain architectures. The ability to describe applications, in terms of the properties they share, offers software designers a vast new landscape for implementing software reuse. The ideal professional's handbook. Daniel Duffy is founder of Datasim, a company that has provided training and consultancy in object-oriented technology areas since 1987. He is also the author of "From Chaos to Classes". He resides in Amsterdam, Netherlands. PART I: BACKGROUND AND FUNDAMENTALS. 1. Introducing and motivating domain architectures . 1.1 What is this book? 1.2 Why have we written this book? 1.3 For whom is this book intended? 1.4 Why should I read this book? 1.5 What is a domain architecture, really? 1.6 The Datasim Development Process (DDP). 1.7 The structure of this book. 1.8 What this book does not cover. 2.2 Management Information Systems (MIS) (Chapter 5). 2.3 Process Control Systems (PCS) (Chapter 6). 2.4 Resource Allocation and Tracking (RAT) systems (Chapter 7). 2.5 Manufacturing (MAN) systems (Chapter 8). 2.6 Access Control Systems (ACS) (Chapter 9). 2.7 Lifecycle and composite models (Chapter 10). 3. Software lifecycle and Datasim Development Process (DDP). 3.4 The requirements/architecture phase in detail. 3.5 The object-oriented analysis process. 3.6 Project cultures and DDP. 3.6.6 Process-driven style and the DDP. 4. Fundamental concepts and documentation issues. 4.2 How we document domain architectures. 4.3 Characteristics of ISO 9126 and its relationship with domain architectures. 4.5 Goals and core processes. 4.9 Defining and documenting use cases. Appendix 4.1 A critical look at use cases. PART II: DOMAIN ARCHITECTURES (META MODELS). 5.3.1 Simple Digital Watch (SDW). 5.3.2 Instrumentation and control systems . 5.5 Goals, processes and activities. 5.6 Context diagram and system decomposition. 5.7 Stakeholders, viewpoints and requirements. 5.10 Specializations of MIS systems. 5.10.1 Example: Noise control engineering. 5.11 Using MIS systems with other systems. 6. Process Control Systems (PCS ). 6.3.1 Simple water level control. 6.4 Reference models for Process Control Systems. 6.4.1 Basic components and variables. 6.6 Goals, processes and activities. 6.7 Context diagram and system decomposition. 6.8 Stakeholders, viewpoints and requirements. 6.8.1 Input and output variable completeness. 6.8.4 Human-Computer Interface (HCI) criteria. 6.11 Specializations of PCS systems. 6.12 Using PCS systems with other systems. Appendix 6.1 Message patterns in Process Control Systems. 7. Resource Allocation and Tracking (RAT) systems . 7.3.1 Help Desk System (HDS). 7.5 Goals, processes and activities. 7.6 Context diagram and system decomposition. 7.7 Stakeholders, viewpoints and requirements. 7.10 Specializations of RAT systems. 7.11 Using RAT systems with other systems. 8.5 Goals, processes and activities. 8.6 Context diagram and system decomposition. 8.7 Stakeholders, viewpoints and requirements. 8.10 Specializations of MAN systems. 8.11 Using MAN systems with other systems. 9. Access Control Systems (ACS). 9.3.1 The Reference Monitor model. 9.5 Goals, processes and activities. 9.6 Context diagram and system decomposition. 9.7 Stakeholders, viewpoints and requirements. 9.10 Specializations of ACS systems. 9.10.1 Security models for Web-based applications. 9.10.2 Access control during design: the Proxy pattern. 9.11 Using ACS systems with other systems. 10. Lifecycle and composite models. 10.5 Goals, processes and activities. 10.6 Context diagram and system decomposition. 10.7 Stakeholders, viewpoints and requirements. 10.10 Specializations of LCM systems. 10.11 Using LCM systems with other systems. 11. Project resource management system: Manpower Control (MPC) system. 11.2 Description and scope of problem. 11.3 Core processing and context diagram. 11.4 Requirements and use case analysis. 11.4.1 Functional requirements and use cases. 12. Home Heating System (HHS). 12.4 Goals, processes and context. 12.5 System decomposition and PAC model. 12.6 Viewpoints and requirements analysis. 13. Elevator Control System (ELS). 13.2 Domain categories and ELS. 13.3 A traditional object-oriented requirement specification. 13.4 Re-engineering ELS: goals and processes. 13.5 Stakeholders and their requirements. 13.7 System decomposition of ELS. 13.8 PAC decomposition of ELS. 14. Order Processing Systems (OPS). 14.2 Customer Requirements Specification (CRS): the product management vision of OPS. 14.2.1 Business concerns and stakeholders' viewpoints. 14.3 OPS as a lifecycle model. 14.3.1 Order Creation System (OCS). 14.3.2 Order Realization System (ORS). 14.3.3 Order Management System (OMS). 14.5 Collecting requirements from multiple stakeholder viewpoints. 14.6.1 Class models and diagrams. 14.7 Design guidelines for OPS. 14.8 Functional and non-functional requirements and their realization. 14.9 Database repository: an architectural style for data-driven systems. Appendix 14.1 Documenting use cases. Appendix 14.2 Some UML class diagrams. 15. Drink Vending Machine (DVM). 15.2.1 Scope and span of problem. 15.3 Goals, processes and context. 15.5 Creating an initial PAC model. 15.7 Interaction diagrams and interface discovery. Appendix 15.1 Collaboration diagrams in a nutshell. 16.2.1 General description of problem. 16.6 The proof of the pudding: enter the ACE library. 16.7 The challenge: applying the ACE library in the extrusion application. Appendix 16.1 An introduction to multi-threading. PART IV: DOMAIN ARCHITECTURE SUMMARY AND 'HOW TO USE' DOCUMENTATION. 17. Summary of domain architectures. 17.2 Object Creational Systems (OCS). 17.3 Object Alignment Systems (OAS). 17.4 Object Behavioural Systems (OBS). 17.5 Keeping the domain architectures distinct and orthogonal. 17.5.9 MIS and PCS versus ACS. 18. Using domain architectures and analogical reasoning. 18.2 In which domain architecture does my application belong? The bird-watching method. 18.3 Focusing on essential system features: the framework method. Appendix 18.1 Analogical reasoning and learning by analogy. Appendix 1. The Inquiry Cycle and related cognitive techniques. A1.3 An introduction to the Inquiry Cycle model. A1.4 Using the right questions. Appendix 2. The Presentation-Abstraction-Control (PAC) pattern . A2.2.1 A short history of objects. A2.2.2 Subsuming object orientation in a broader context. A2.3.1 System decomposition and activity diagrams. A2.3.2 System decomposition and context diagrams. A2.4 PAC and object-oriented analysis. A2.5 The relationship between PAC and UML. Appendix 3. Relationships with other models and methodologies. A3.2 Information hiding and the work of David Parnas. A3.4 Michael Jackson's problem frames. A3.6 The Garlan and Shaw architectural styles. A3.7 System and design patterns. A3.8 The Unified Modelling Language (UML). Appendix 4. The 'Hello World' example: the Simple Digital Watch (SDW). A4.2 Features and description of problem. A4.4 Stakeholders, viewpoints and requirements. A4.5 Context diagram and system decomposition. Appendix 5. Using domain architectures: seven good habits .